Our nine hole golf course (with practice nets and putting green) is challenging for serious and occasional golfers alike - with holes ranging from 110 yards right up to 350 yards! Golf rates from just £10.00 are available for Bay View holidaymakers, with memberships also available. Bring your own clubs, or you can hire a set for your round. Our clubhouse is open from 8am till dusk and serves breakfast, light refreshments, wines and beer, and there are the occasional Saturday night barbecues out on the deck overlooking the course. We also have a P.G.A. Professional Golfer, Shaun Creasey for lessons, please call the Club House on 01323 769384. Bring your own clubs, or you can hire a set for your round. Our new clubhouse serves light refreshments, wines and beer, and there are the occasional Saturday night barbecues out on the deck overlooking the course. *No green fees. Special promotions will be offered to members throughout the year. The first is a testing opening hole, complimented by a terraced green. Narrow fairway containing a tree lined bank to the left and a steep sided bank to the right, make an accurate drive crucial. This is very much a risk-reward hold. Recently constructed into a dogleg, with no sight of the green, tee off blind over trees or play safe and lay up into the fairway. An inviting, wide-open fairway, but with a tight line of trees up the right and a light bush to the left of the green, this hole is not to be taken lightly. A short hole protected by tight banks and a bunker set at the front of the green, made more difficult with the gallery watching. Danger all up the left hand side, with out of bounds and a bunker just of the green. A wide entrance provides a great birdie try. One of the largest greens on the course, but with a narrowly cut fairway and a bank lined with gorse bushes to the right makes this hole challenging. The longest hole on the course, with a green hugged by a line of thick trees and a deep bunker to the left. However low banks around the green makes it an inviting target. The length makes this one of the easier holds, a gentle pitch into a slightly sloped green. But beware, as steep banks and boundary woodland can catch you out. A good challenging finish, 250 yards back towards the clubhouse. Strategically placed bunkers in the centre of the fairway and one either side of the green make life tricky, and out of bounds down the right encourage an accurately placed tee shot. Whether you want to hire a 9 iron or a complete set - we can help! Bay View Park Golf course are pleased to be able to offer private hire of our golf facilities to societies, groups and companies. The 9 hole golf course, with holes ranging from 109 to 328 yards, is a challenge for both regular golfers and those who are new to the game. There are practice nets, a putting green and golf club hire also available. The course and clubhouse can be hired for your private function during early evenings. Play a relaxing round of golf with your friends, work colleagues or clients, followed by refreshments and prize giving in the clubhouse afterwards. The course can be played in approximately one and a half hours. The clubhouse is fully licensed to serve beer, wines and light meals. We also have facilities to organise BBQ's. Whether you want to hire a 9 iron or the whole club - we can help! The Club shall be called Bay View Golf (The Club) and shall be a proprietary Club owned by Bay View Park Ltd., Old Martello Road, Pevensey Bay, East Sussex and administered by the Golf Manager (The Manager) or by such person the Owner shall nominate. 2.1 Membership is on an annual basis. 2.2 Persons wishing to become Members of the Club shall complete the application form (downloadable as a pdf below) and return it to the Golf Clubhouse. 2.3 Absolute discretion is granted to the Owner to reject any application for, or renewal of, membership without ascribing any reason for so doing. In such cases any monies sent will be refunded. 2.4 On acceptance of an application, the applicant will be sent a Membership Card which will remain the property of the Owner and upon the termination of membership for whatever reason will be returnable to the Owner on demand. 2.5 Membership is strictly non-transferable. 3.1 Membership is on an annual basis. Subscriptions are to be annually. On the annual basis the appropriate annual subscription is payable in full in advance either in cash or by cheque. No increase in subscription rates will be levied during the year for which an annual subscription has been paid. Save under Rule 11 no refunds of subscriptions will be made. 3.2 The Owner shall from time to time determine the amount of the subscription and charges, if any, for each of the facilities. Changes shall be solely at the Owner's discretion. 3.3 Membership of the Club shall commence from the day of acceptance following receipt and clearance of the subscription payment. 4.1 Persons under 16 years of age must be accompanied in the Club and on the course by an adult who will at all times be responsible for the person's conduct. It being recognised that neither the Club, the Manager nor the Owner has responsibility on their behalf. 4.2 Members are particularly advised not to undertake strenuous physical activity for which they might be medically unfit and neither the Owner nor the Manager will be in any way responsible for any harm which may come to a Member or as a result of their undertaking within the Club, any activity which is beyond their physical capability. Members are advised to have a medical consultation and assessment before commencing exercise. 4.3 Members should not use the Club while under the influence of alcohol, anti-histamines, vasoconstrictors, narcotics or tranquilisers. Those with diabetes, heart disease or high/low blood pressure should check with their doctor that it is safe for them to use the Club's facilities. 4.4 Members should be suitably attired whilst using the facilities. Golf shoes or Training Shoes are to be worn at all times on the course. 4.5 The Owner reserves the right to restrict the numbers of Members using the facilities at any one time. On entering the Club, all Members must sign-in at the reception desk. Current membership cards must be shown. No Member shall at any time introduce any Guest who has been rejected as a Member or had membership terminated or suspended. The times at which any or all of the facilities shall be available to Members and Guests shall be at the discretion of the Owner or the Manager. Any or all of the facilities may be closed at any time for the purpose of the cleaning, decorating, repairs, events or for special functions. Members subscription will not be refunded, reduced or extended. The Owner and its employees will not be liable in any way for the loss of, or damage to, the property of Members or Guests or for the personal injury to, or death of, any Member or Guest, except to the extent that such loss, damage, personal injury, or death arises from the willful act, neglect or default of the Owner or any of its employees or agents. The Owner and the Manager in their absolute discretion and without giving any reason therefore, may at any time terminate the membership of any Member. It shall be at the sole discretion of the Owner, whether or not a Member's subscription shall be repayable to him in whole or in part in any case of termination of membership. The Owner shall have the power and the right at any time upon one month's notice to Members to discontinue the Club upon refunding to Members the unexpired portion of their current subscription. 10.1 By their membership Members accept and agree to be bound by the Rules of the Club from time to time in force, and to use the Club and its facilities in a proper and prudent manner. 10.2 Any Member or Guest who in the sole opinion of the Manager does not comply with the rules shall be required to leave the premises immediately and without argument. 10.3 The Club reserves the right to require any Member to make good or indemnify the Club against any danger or destruction of Club facilities caused by the negligence, default or wrongful act of such Member or their Guest(s). 10.4 The Owner in its sole discretion may at any time vary these rules or any entry fee or membership subscription or any of the charges for the use of any or all of the facilities. 10.5 Members will further comply with any discretion which the Manager may give to ensure the smooth operation of the Club, the use of the facilities and the convenience of all. 10.6 Any dispute or difference which may arise in regard to the interpretation of these Rules shall be determined by the Manager whose discretion shall be final and binding on all Members. Members are not permitted to bring pets onto the course. 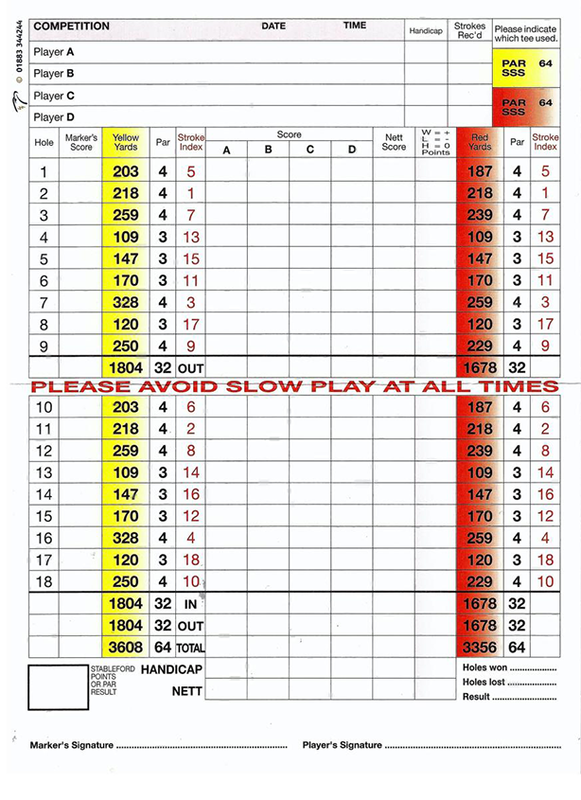 Local rules and etiquette, as per golf score card, must be observed. The Club recognises the Royal and Ancient Golf Club of St. Andrews as the ruling body of amateur golf within the UK and agrees to abide by the Rules of Golf and Amateur status as laid down by the R & A. The Club agrees to comply with the Constitutions of Rules of the English Golf Union and Sussex Golf Union.